Package delivery company UPS is planning to deploy 100 fully electric commercial vehicles on package delivery routes in California. The move is being done in partnership with several California agencies, and in part helps California satisfy an executive order signed by Gov. Jerry Brown a year ago that's aimed at increasing the presence of zero emission vehicles in California. Commercial fleet owners are more able than typical consumers to recognize the monetary benefits of electrified vehicles. These include lower fuel costs, lower maintenance costs, less vehicle downtime because of less required maintenance, and better driver satisfaction. UPS expects these electric trucks will reduce the consumption of conventional motor fuel by approximately 126,000 gallons per year. The vehicles have a range of up to 75 miles and primarily will deliver packages to customers in Sacramento, San Bernardino, Ceres, Fresno and Bakersfield. The vehicles are being manufactured by Electric Vehicles International (EVI) in Stockton California. Government partnership includes the Governor’s Office of Business and Economic Development, California Air Resources Board, California Energy Commission, U.S. Environmental Protection Agency, South Coast Air Quality Management District, San Joaquin Air Pollution Control District and Sacramento Air Quality Management District. The executive order in question was signed in late March, 2012. It was part of the announcement of the settlement with NRG that opened the door for eVgo to set up electric car charging station operations in California. The executive order calls for a series of electric vehicle infrastructure development goals in 2015, 2020, 2025 and 2050. The milestones include: By 2015, "major metropolitan areas will be able to accommodate zero-emission vehicles;" By 2020, "zero-emission vehicle infrastructure will be able to support up to one million vehicles;" By 2025, "over 1.5 million zero-emission vehicles will be on California roads;" and By 2050, "a reduction of greenhouse gas emissions from the transportation sector equaling 80 percent less than 1990 levels." The vision is one of California being a hub not only for deployment of clean transportation technology, but a hub for development of that technology. This project has been underway for a couple years. 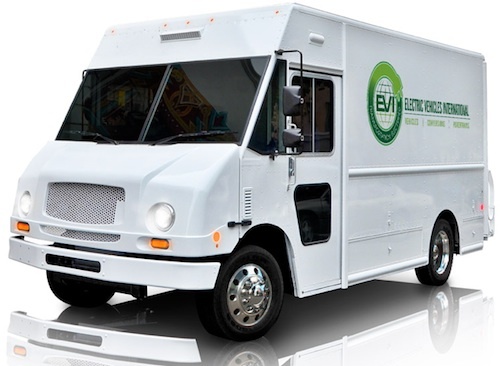 For EVI it is part of a larger initiative to sell over 500 electric delivery trucks in California.